GIFs are great— and certainly not going anywhere anytime soon if all the new GIF libraries and GIF keyboards showing up on different social sites are any indication. 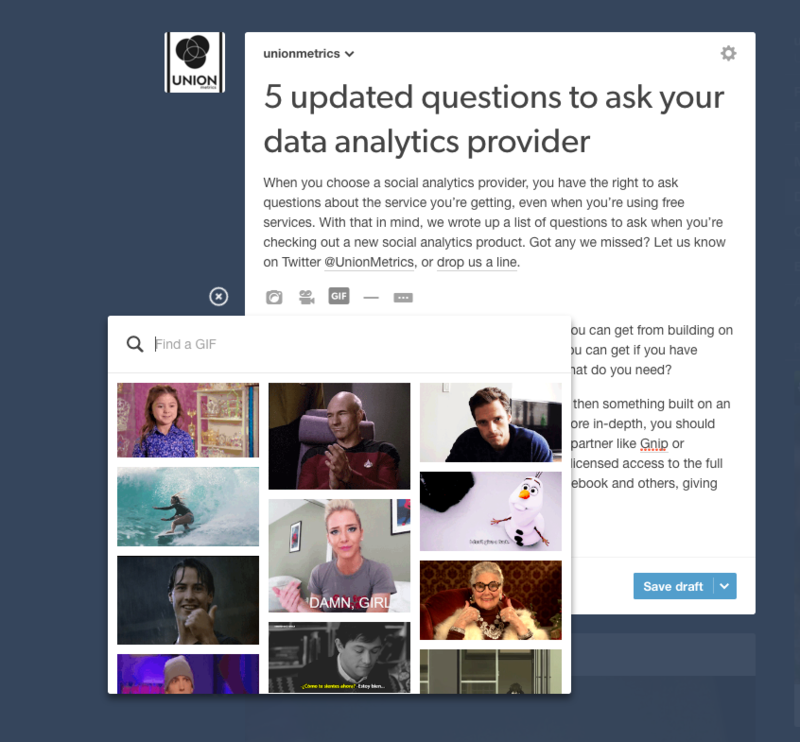 But the Tumblr-uninitiated sometimes think the platform runs solely on GIFs, which is not the case. Here’s our advice for moving beyond the GIF on Tumblr. Mix up your content strategy to see what your audience likes best. Tumblr keeps adding new features and ways to share your content, so don’t feel limited to just slapping a GIF on a text post and calling it a day— that’s not how you speak the language of Tumblr, anyway. (More on that in a minute.) Pull from Tumblr’s new GIF library whenever it feels right, but also experiment with cinemagraphs, videos and different video formats as well as the classic still photo and photoset. Base the visual medium that you choose on the story you want to tell. Which one gives you the best way to tell it? And don’t be afraid to tease out parts of the story in other formats. GIFs from a video, for example, are great for that. Be sure you’re really speaking the language of the GIF and, more importantly, Tumblr in general. The audience is, so to speak, self-aware. So what do you do? Listen to what they’re saying: Aim to make content that “raises the common experience to a new level”. And not just on Tumblr, but everywhere that you’re trying to reach a similar audience. Remember that just because something is a best practice- or assumed essential part of a platform- doesn’t mean that’s what your particular audience likes. Also remember that your audience is made up of people who live in the same world that you do and are often savvy about marketing down to the terminology used. Phone it in, and they’ll call you out on it with a sassy reblog. Want to see how you’re doing on Tumblr? We can help with that, and with everything else too.